Restaurant, Guest House, Shop & Post Office. Our guesthouse is Failte Ireland Approved. Fáilte Ireland provides strategic and practical support to develop and sustain Ireland as a high-quality and competitive tourist destination. What is the EU Flower? 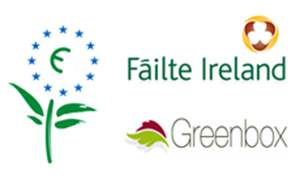 Established in 1992, the EU Eco – Label “Flower” is a unique certification scheme aimed to help European consumers distinguish greener, more environmentally friendly, products and services. Over the past ten years, the “Flower” has become a European-wide symbol for products, providing simple and accurate guidance to consumers. All products bearing the “Flower” have been checked by independent bodies for complying with strict ecological and performance criteria. The EU Flower is a recognised environmental quality mark across the countries of the EU and in Norway and Liechtenstein, and the award of the label is independently verified and endorsed by the European Commission. It is administered by the European Eco-labelling Board (EUEB) and receives the support of the European Commission, all Member States of the European Union and the European Economic Area (EEA). The Eco-labelling Board includes representatives such as industry, environment protection groups and consumer organisations.